With was raging in the skies above the Channel, Peggy is putting on a brave face, but she knows Germany could invade any day. Though the family farm and her brother, Ernert's, worries keep her busy, it's hard to ignore the rumble of guns, the rumours of spies and the malicious gossip in town. Peggy must grown up fast - and when a young Polish pilot, Henryk, crash-lands near her home, she faces a terrible test of love and loyalty. When so much could go wrong. In one extraordinary burning summer, her life will change forever. 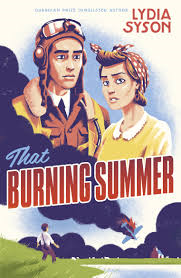 'That Burning Summer' was an eye-opening book. Bringing forward a hidden part of History in the form of Henryk, it had a sophisticated yet simple writing style that brought alive a captivating romance that I was willing on! Set in England during 1940, Germany could invade any day but, no one knows when. In the middle of this is sixteen year old Peggy who, does something that may have severe consequences for two of our main protagonists. I felt very connected to the characters from the beginning; their stories were realistic and from the switching point of views, you got a very clear image of their personalities. Not just that though, you got a sense of their fears - and I liked that their experiences had affected them - and a piece of their past in the form of flashbacks from Henryk about his time in the Polish Air Force. Of course, with Henryk there were always a wavering doubt with him - but, the way Syson has written it allows you to see various sides of the same time in History. Peggy is the driving-force of this novel, no doubt. She is coming-of-age in a difficult time and falling in love when all she can rely on is trust. While reading this book, you won't be able to help imagining yourself in her shoes. Ernest was a character that represented the fact that children can't just be hidden from War - I did like that they all stood for something; that they were all telling the same story although very different ideas. But, siblings and their curiosity get in the way, don't they? A leaflet is presented to you at the beginning at the book that you soon find out was sent out to all members of the public detailing how to act in a German invasion. The novel was set around 'If the Invader Comes' and each part was set around one of the rules listed. Peggy's brother becomes fixated on these rules, and keeps a watchful eye out for the Germans. Ernest wants to be the man in the family yet, feels he has to prove it to himself. At this point, the excitement really picked up! The listing idea gave the novel a clear-structure, something I really liked and even foreshadowed what may happen in the next chapter. This was one of the main parts of the book, it kept me reading. I couldn't help but guess, think about and start going 'I know what's going to happen!" Syson took on a challenging part of this period of History - I know the story behind what happened but, only the more well-known information. There was a romance building up throughout this - and, I'm not over-exaggerating when I say this is one of the most well-written I have come across in a while. It was given time to build-up and kept me turning the pages - I was rooting for them, and the danger of things going wrong brought tension into the plot. Although, I enjoyed this, I did find some parts of the plot confusing at times, which meant I had to flick back and try to find out which character it was, for example. Also, 'That Burning Summer' came to a really abrupt ending. At what I felt was in the middle of the action, and a good-chance to throw in a heart-racing scene, it stopped - and an Epilogue that was quite blunt filled it's place. The Epilogue wasn't needed for me, and left me with too many loose-ends. I know there's not any sequel in the works at the moment but, I wanted more from the execution of ending the book the way it began. The writing also lost a poetic-feel it had in the first few chapters - something I adored as it was so unique in a crowded-place. I do feel like I am being a bit harsh on this book - but, I am definitely going to find some time to read Syson's other novel. Thank you Hot Key Books! I had a free-copy of this book in exchange for an honest review. I do completely recommended checking out Lydia's website which I linked above! I am the only one who just adores the layout? Also, If you want to check out my new rating system and what it means, you can find it on my sidebar! I read this a couple of weeks ago and really enjoyed it, so I'm glad you liked it too. Have you read Lydia Syson's first novel? It's called A World Between Us and is set during the Spanish civil war - I'd definitely recommend it if you enjoyed this. Lovely review! I love books based on history when there are twists and especially love that you shouldn't have fallen into. Love the review, haven't heard of this before but adding to the TBR pile RIGHT NOW. Brilliant review Sophie, I think we have similar thoughts about this one! I agree with you about the ending too... especially the last line... I wish it had had a more emotional impact on me!